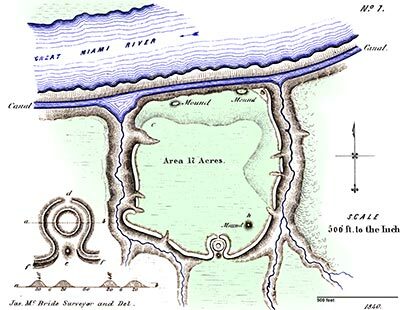 Ancient Monuments of the Mississippi Valley - PLATE VIII. From the Surveys and Notes of JAMES MCBRIDE. Lidar image showing the features of this fortified hilltop. THIS work occurs on the bank of the Great Miami river, four miles above the town of Hamilton, in Butler county, Ohio, and is one of the most interesting hill-works known. It corresponds in all essential particulars with those of the same class already described. 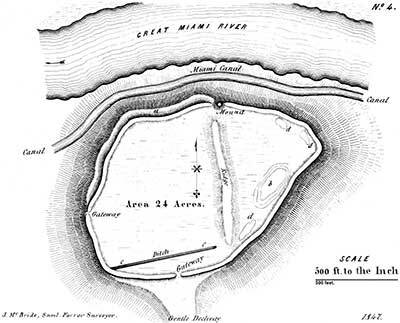 It occupies the summit of a promontory cut from the table lands bordering the Miami river, which upon three sides presents high and steep natural banks, rendered more secure for purposes of defence by artificial embankments thrown up along their brows. The remaining side is defended by a wall and ditch, and it is from this side only that the work is easy of approach. The walls are low, measuring at this time but about four feet in height. The area enclosed is level, subsiding somewhat towards the north, so as to form a sort of natural terrace along the river. Previous to the construction of the Miami canal, this terrace was eight or ten rods wide, having a perpendicular bank next the river, some fifty or more feet high. Upon this terrace are situated several small mounds. The point indicated by c in the plan is the most elevated within the enclosure. The ground here was intermixed with large stones, most of which were removed in building the canal. Among them, it is said, were found several human skeletons, and also a variety of carved stone implements. The most interesting feature in connection with this work is the entrance on the south, of which the enlarged plan can alone afford a fair conception. The ends of the wall curve inwardly as they approach each other, upon a radius of seventy-five feet, forming a true circle, interrupted only by the gateways. 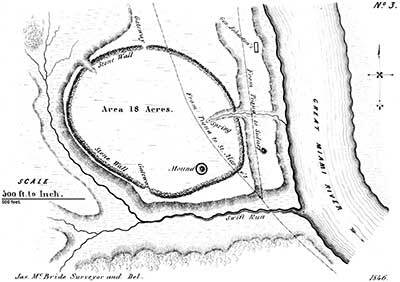 Within the space thus formed, is a small circle one hundred feet in diameter; outside of which and covering the gateway is a mound, e, forty feet in diameter and five feet high. The passage between the mound and the embankment, and between the walls of the circles, is now about six feet wide. The gateway or opening d is twenty feet wide. This singular entrance, it will be remarked, strongly resembles the gateways belonging. to a work already described (Plate VI. ), although much more regular in its construction. The ditches, f f, which accompany the wall on the south, subside into the ravines upon either side. These ravines are not far from sixty feet deep, and have precipitous sides, rendering ascent almost impossible. The mound h is three feet high. The area of the work is seventeen acres; the whole of which is yet covered with a dense primitive forest. The valley beyond the river is broad, and in it are many traces of a remote population, of which this work was probably the fortress or place of last resort, during turbulent periods. THIS work is situated six miles south-west of the town of Hamilton, in Butler county, Ohio. It has no very remarkable features, although possessing the general characteristics of this class of works. It consists of a simple embankment of earth carried around the brow of a high, detached hill, overlooking a wide and beautiful section of the Miami valley. The side of the hill on the north, towards the river, is very abrupt, and rises to the height of one hundred and twenty feet above the valley. The remaining sides are steep, though comparatively easy of ascent. The walls are scarcely four feet high, and seem to have been much reduced by time. There are six gateways, two of which open upon natural bastions or lookouts, and the remaining four towards copious springs, as shown in the plan. The ground within the walls rises gradually to the centre, from which an extended view of the valley and surrounding country may be obtained, There are two mounds of earth placed near together on the highest point within the enclosure, measuring respectively ten feet in height. South-east of the work, and nine hundred feet distant, is an eminence A, about fifty feet higher than the one occupied by the above mentioned work,—being much the highest point in the neighborhood. The area on the top is, however, inconsiderable. There are some traces of ancient occupation here, though they are far from being distinct or considerable. 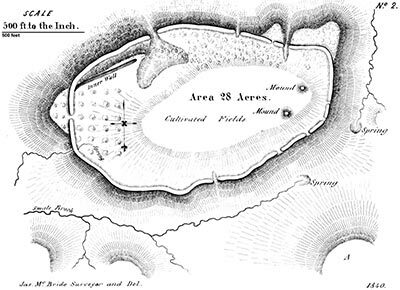 Below this entrenchment, and on the present site of the town of Piqua, a group of works formerly existed, consisting of circles, ellipses, etc. These have been described at length, by Major Long.18 There are also various small works on the opposite bank of the Miami. Indeed, the whole valley is here covered with traces of a former dense population. This work resembles one already described, No. 2 of this Plate. It is situated on the bank of the Great Miami river, three miles below Dayton, Montgomery county, Ohio. The side of the hill towards the river is very steep, rising to the height of one hundred and sixty feet. The remaining sides are less abrupt. Upon the south is the principal gateway, and here the declivity is gentle. This gateway is covered upon the interior by a ditch, c c, twenty feet wide, and seven hundred feet long. At d d d are dug holes, from which it is apparent a portion of the earth composing the embankments was taken. At b is a natural depression forty feet deep, and covering not far from one and a half acres. At the northern slope of the narrow ridge which intersects the work, and within the line of the embankment of which it forms a part, is a small mound. From its top a full view of the surrounding country, for a long distance up and down the river, may be obtained. A terrace, apparently artificial, skirts the north-west side of the hill, thirty feet below the embankment. As remarked in a former instance, this terrace may be natural; it has, however, all the regularity of a work of art. "The adjacent hill, at the distance of half a mile, and at the greater elevation of about one hundred feet, is the site of a stone wall, mainly circular, and enclosing perhaps twenty acres. The valley of the river on one side, and a deep ravine on the other, render access to three-fourths of this fortification extremely difficult. The wall is carried generally along the brow of the hill, in one place descending a. short distance, so as to include a spring. The silicious limestone of which it was built, must have been transported from the bed of the river, which, for two miles opposite these works, does not at present afford one of ten pounds weight. They exhibit no marks of the hammer or any other tool. The wall was laid up without mortar, and is now in ruins." 18. Long's Second Expedition, vol. i. pp. 54-66. 19. Surveyed by James McBride, Esq. and Samuel Forrer, Esq. of the Ohio Board of Public Works.